Bob Bunn is a Regional Technical Manager for Johns Manville’s Industrial Insulation Group (www.jm.com) and provides product application technical support and training to facility owners, engineers, contractors, and distributors throughout the eastern half of the United States and Canada. Over the past 40 years, Bob has held leadership positions in engineering, manufacturing, sales, and distribution across the residential, commercial, and industrial insulation markets. Over the past several years, Bob has driven product specifications at the facility and engineering levels and has successfully created demand for Johns Manville’s portfolio of high temperature industrial insulation products and accessories. He can be reached at Bob.Bunn@jm.com. Industrial insulation specifications are the result of copious notes, research, and specifications that are refined over time and compiled into documents. These documents are then shared with the prominent stakeholders in industrial facility construction and maintenance projects. They are a necessary component of most, if not all, industrial process and equipment designs. Even so, it is not uncommon to encounter specifications that are 10 to 15 years old (or older) at large, well-respected engineering firms or industrial facilities. In many situations, these specifications haven’t been dusted off during that time to see if the content is still accurate and up to date. 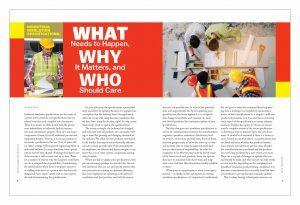 There are a number of reasons why this happens: sometimes no one is assigned the responsibility of maintaining the specifications when there is employee turnover or staffing reductions, or a person who has been the designated “spec expert” retires and no one is given the task of maintaining the specifications. So, year after year, the specifications remain filed away and fail to be updated because of a popular misconception that the industry hasn’t changed much. After all, we are still using the same insulation that we have been using for decades, right? So why create unnecessary work to update the specifications? The reason is simple: the industry has changed, and both new and old products are constantly evolving to meet the growing and changing demands of the industry. We often see new products introduced to the market that may be more thermally efficient, can save money, provide safer work environments for employees, are thinner and lighter weight, or can lower the cost of other system components, among other benefits. When you fail to update your specifications, then you are assuming (perhaps incorrectly) that the current insulation that you use and specify ensures that your processes are running at optimum efficiency, that your employees are operating in the safest of conditions, and that you have saved all the money that you can possibly save. In view of the potential risks and opportunities lost by not updating your specifications, the better approach is to recognize that change is inevitable and constant. As such, you should prioritize the continuous update of your specifications. The data that goes into insulation specifications is a form of communication between the manufacturers, engineers, specifiers, estimators, distributors, facility owners, contractors, and end users. Each of these function groups needs to know the most up-to-date and accurate data in order to make informed decisions in their areas of responsibility. In order for employees to be effective, they must be keenly aware of the latest trends and products, know the options they have to minimize both short-term and long-term costs, and have this information readily available to them. When given an opportunity to write a new specification—or ideally, review and update an existing insulation specification—it’s important to understand the end goal or what the customer/client/engineering firm is looking to accomplish by sponsoring a review of their specifications. Is it simply to add new product information, or is it an exercise in reviewing every aspect of the specification to ensure ultimate accuracy? If given the option to choose, we recommend a complete review of the entire specification to determine ways to improve upon the core document. It should be determined if there is a better or easier format to use, if products or manufacturers that are listed still exist, whether the product formulations, names, and references are the same, whether the manufacturer was purchased and the products are now being produced by a new owner, and more. There are a myriad of changes or updates that can and should be made, and this exercise can take weeks or even months, depending on the complexity and breadth of insulation products being considered. It is this time commitment that can easily derail the best of intentions to get specification manuals updated. This is where having a third-party resource can benefit an organization that chooses to form a knowledgeable and capable team to engage in a specification update. 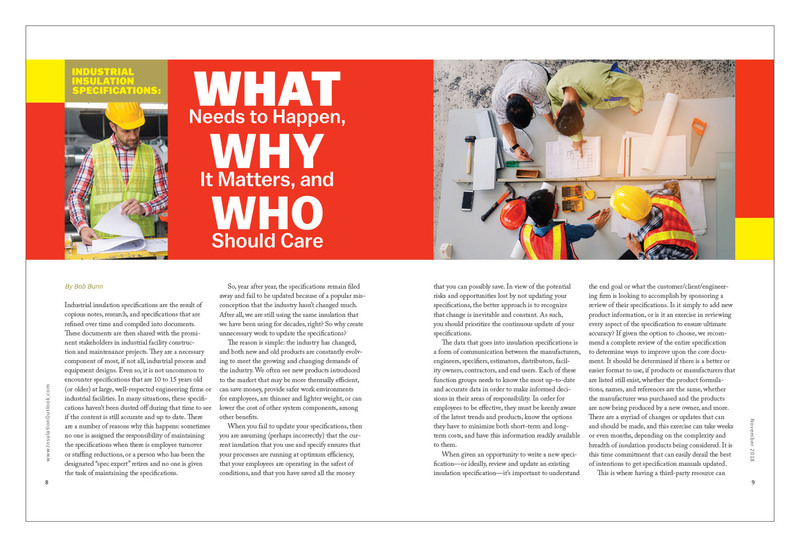 Ultimately, utilizing the assistance of an outside party may be a better option than trying to use internal personnel, who may get pulled off the project to work on more time-sensitive projects. Maintaining up-to-date specifications for industrial products is an absolute necessity in order to ensure that facility owners, engineers, and contractors are on the same page regarding the choices to be made across the many insulation options that are available. Choosing the right insulation material for the application being considered can be a daunting task at times, especially when considering thermal properties, compressive strength, corrosion under insulation (CUI), moisture absorption or resistance, surface burning characteristics, etc. By being proactive and updating your industrial insulation specifications, you will have a much more accurate tool to efficiently approach optimized system design. These current specifications will provide the appropriate technical information to allow facility owners, engineers, and contractors to make well-informed decisions regarding which insulation to specify on a job. This will ultimately contribute favorably toward optimizing process efficiencies, providing personnel protection, conserving energy, and reducing the carbon footprint of the facility.